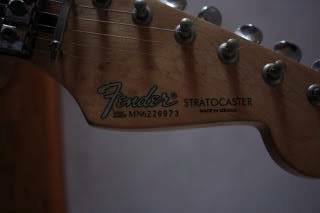 This is a different guitar to the Special Stratocaster which was a name used for a short time for the standard stratocaster in the UK. It is a quality guitar high in the Mexican Range at the time. 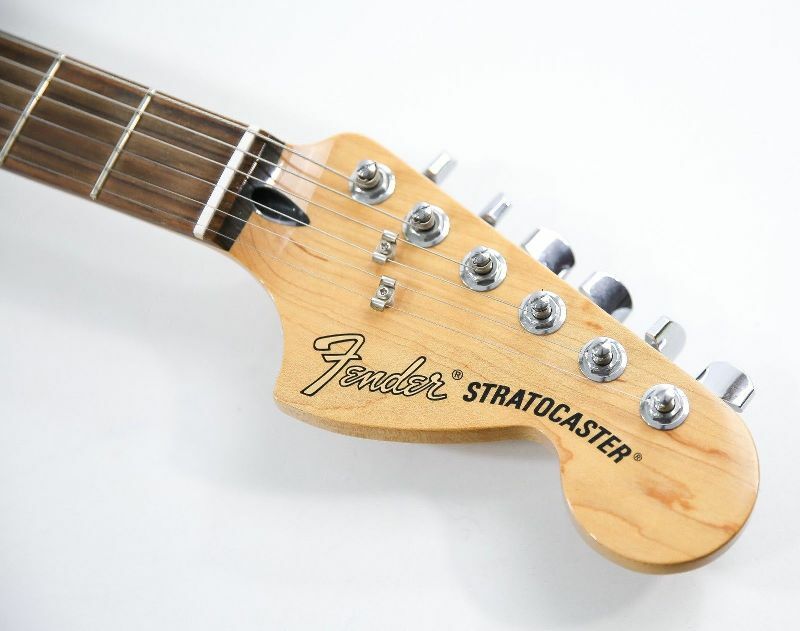 This is as the name suggests an HSS version of the traditional with the same thick black logo and trap tuners. The only picture I can find does anyone have better? 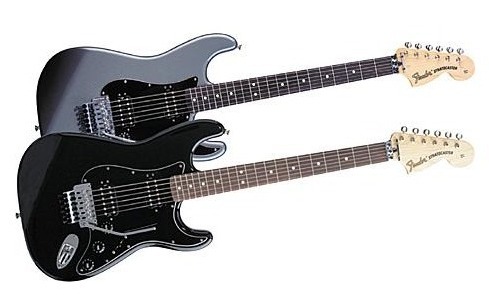 This is two different guitars it was launched in 2008 and completely revised in 2014 discontinued 2017. This is and SSH strat with the addition of a Fishman power bridge which contains piezo pickups which add in acoustic type sounds as required. Colours Black, Sage Green, Midnight Wine, Blue Agave, Brown Sunburst, Arctic White. In 2006 Electron Blue available. The only picture I have is a scan from the catalogue does anyone have better? This is the current version of the Standard HH launched in 2015. Colours at launch Olympic White, Black or Ghost Silver, now Olympic White only. 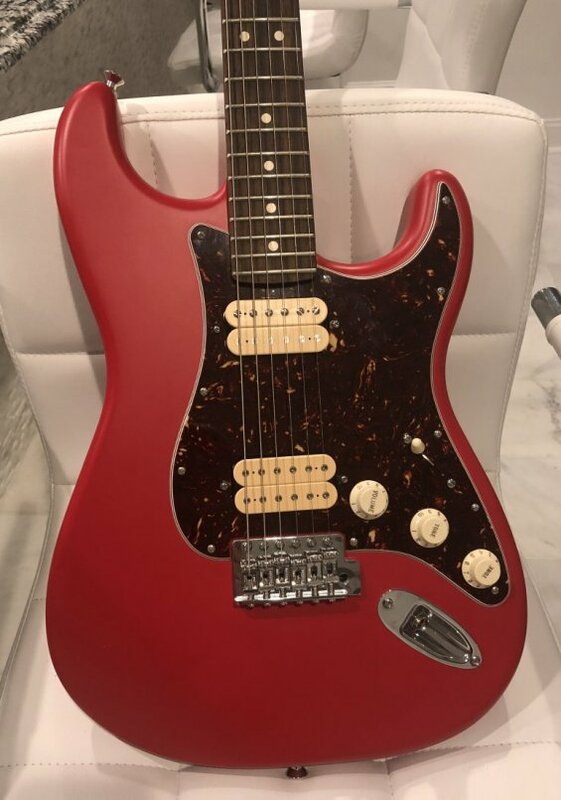 I came across this FSR in Torino Red it has a 2013 or 14 serial number. Don't know how many were made or who for. It's for sale in the UK August 2018. 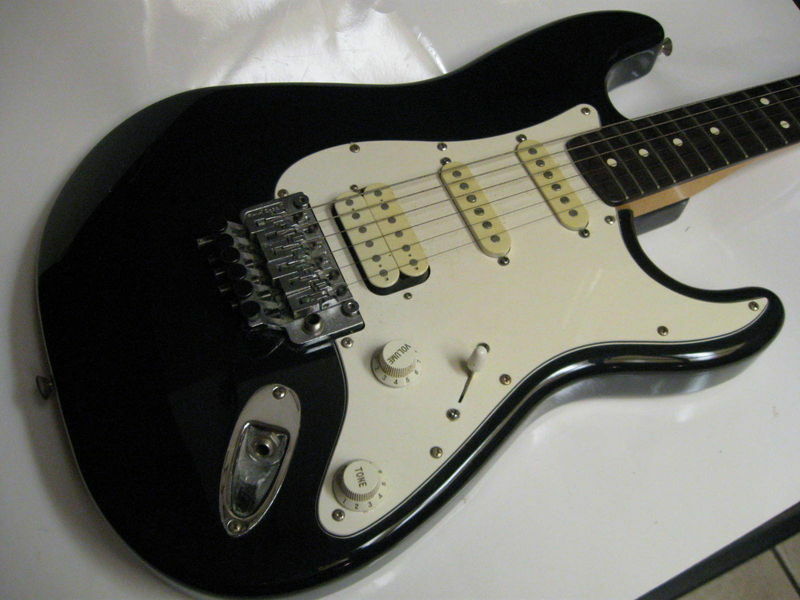 This was released in 2011 and discontinued in 2014 possibly replaced by the standard HH which has Blacktop pickups. This is such an involved guitar that I am merely going to reproduce the blurb from the launch. It was described as the guitar of the future then discontinued after 1 year. 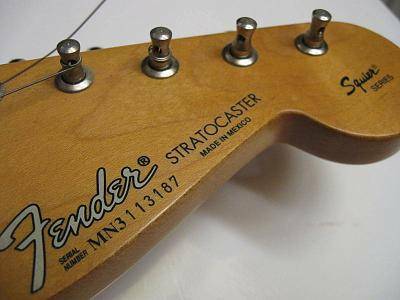 The Stratocaster of the future is here. The Fender Fishman TriplePlay Stratocaster HSS uses state-of-the-art built-in digital technology to give you a thrilling new playing experience in which you can emulate other instruments with ease and create a world of all-new sounds. It's a phenomenal leap forward in the evolution of the world's greatest electric guitar. 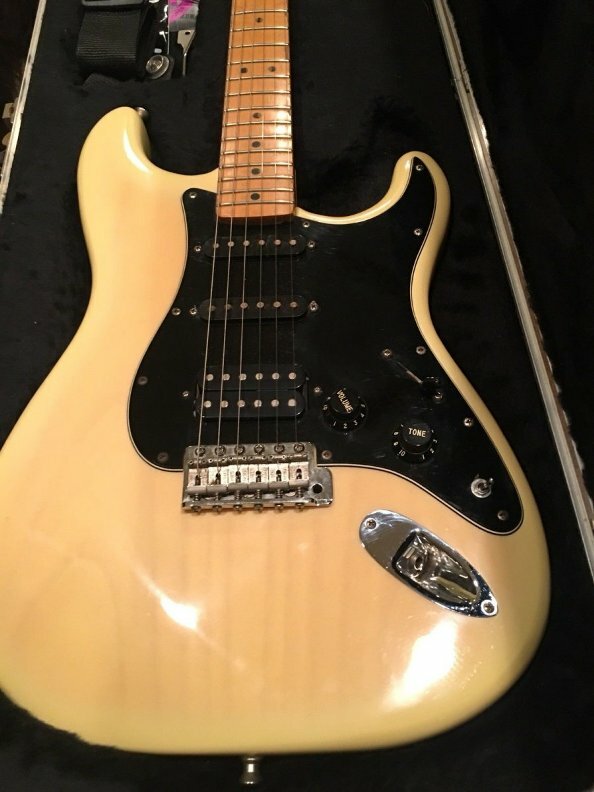 With its potent tonal combination of Vintage Noiseless single-coil Stratocaster neck and middle pickups and a powerful Seymour Duncan Pearly Gates humbucking bridge pickup, it's a fine instrument in the conventional manner. 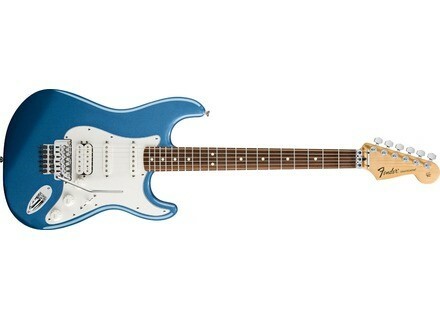 But two other ultra-modern performance features launch this re-imagined Stratocaster into a brilliantly exciting future. Engage the built-in Fishman TriplePlay system, which wirelessly transmits MIDI data to your computer to create virtually unlimited sounds with a wealth of performance, composing and recording features. The Fishman hex pickup, TriplePlay D-pad controller and MIDI volume control are all built into the front of the guitar, with the TriplePlay wireless controller built into the back. The wireless controller transmits the signal from the hex pickup to the included USB transceiver, which plugs into your computer (a handy clip on the back of the headstock holds the transceiver when not in use). For charging the unit, a power supply and micro-USB cable that connects to the TriplePlay wireless controller are included. 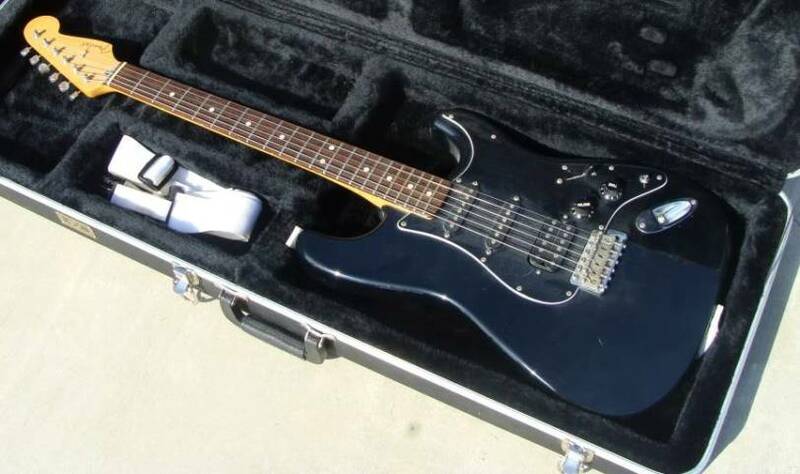 Also, the mini-USB output on the side of the lower bout digitally transmits the audio signals from the three Stratocaster pickups to your computer using the included USB cable. The adjacent 1/8" output jack lets you monitor the proceedings with headphones and has its own volume control on the front of the guitar. Once the signal reaches your computer from the TriplePlay system or from the mini-USB output all the software you need to record, edit and play back your sounds comes in an included USB flash drive that contains Fishman TriplePlay, IK Multimedia SampleTank 2.5 and AmpliTube Custom Shop, and Native Instruments Komplete Elements (additional software such as Notion Progression and PreSonus Studio One Artist available for free download with product registration). 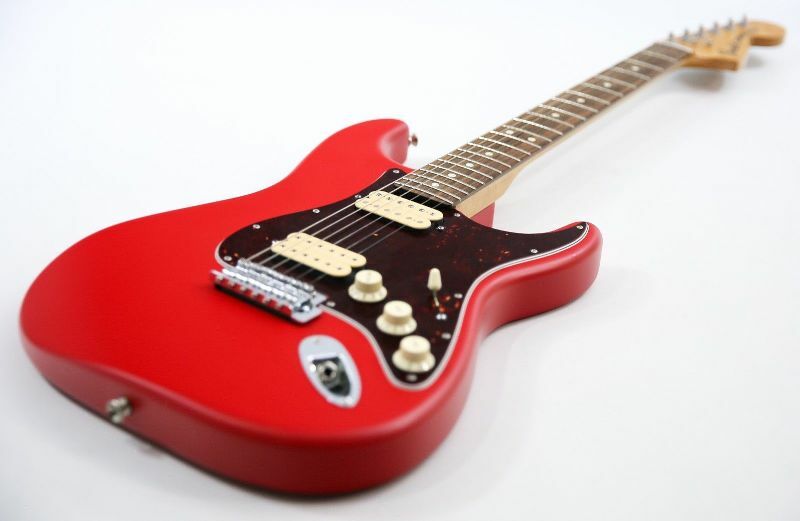 The guitar also features a maple neck with modern C profile and satin finish, rosewood fingerboard with a 9.5" radius and 22 medium jumbo frets, standard master volume control and output jack, standard five-way pickup switching, three-ply parchment pickguard, and vintage style synchronized tremolo bridge with six saddles. Available in Black and 3 colour Sunburst gloss finishes. The Deluxe Stratocaster HSS Plus Top with IOS Connectivity lets you expand the sonic possibilities of the world's greatest electric guitar by plugging it straight into iOS devices such as your iPhone, iPad, iPod or computer with no need for any external devices for easy recording, editing, monitoring and more. Along with all its other great features, you get superior signal to noise ratio and remarkable dynamic range for an exciting and truly state of the art playing experience. The guitar's built in USB audio interface is what does the trick. 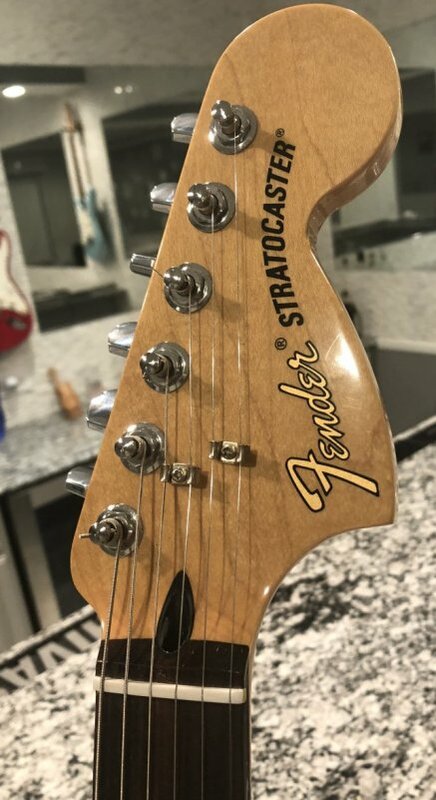 You can always play it as a great sounding standard HSS Stratocaster, but the USB output and 1/8" stereo headphone output on the side of the lower bout deliver a whole other world of sonic versatility and creativity. Use the included USB mini B to Lighting cable to connect the guitar directly to your iPhone, iPad or iPod, or use the included USB mini B to USB Type A cable to connect directly to your Mac or PC And to top it all off, it's a gorgeous guitar with a beautiful flame maple top in a choice of Aged Cherry Burst or Tobacco Sunburst gloss finishes. 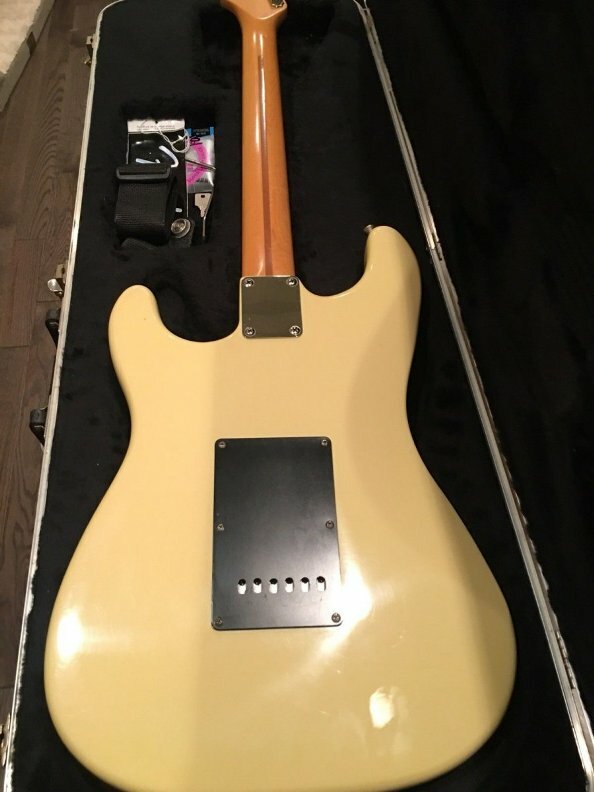 Other features include a maple neck with modern C profile and gloss finish, maple or rosewood fingerboard with 9.5" radius and 22 medium jumbo frets, single coil neck and middle pickups, humbucking bridge pickup, five-way switching and three white plastic control knobs (master volume, master tone, headphone volume), 3 ply parchment pickguard and vintage style synchronized tremolo bridge with six saddles. All information and pictures are from MetalPedal on the Strat forum many thanks. He purchased his guitar from the guitar center so it may be a special run for them.